What kind of plant is used for this bonsai? 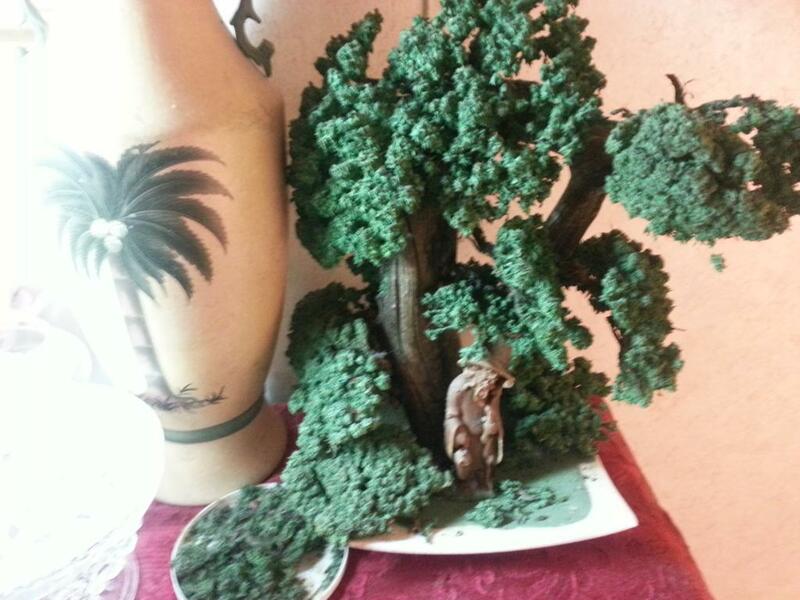 One of my family members got this bonsai tree when I was kid. To my knowledge, it doesn't require food or water - as I've never seen them water it, but it has slowly and steadily grown. Presumably it pulls CO2 from the air to survive. Right, I got curious about this so I did some Google-fu. Mrs. Stewart’s Bluing is a colloidal suspension of extremely minute particles of blue powder (Ferric Hexacyanoferrate). This is not a solution in the true chemical meaning of that word. As the water from the bluing and the clear water which is first added evaporate, two things happen. The blue particles can no longer be supported and the excess salt cannot stay in solution. The salt crystallization process will take place around the blue particles as nuclei, in much the same way as silver iodide cloud seeding accelerates the formation of rain drops. ... The purpose of the porous material (sponge pieces) is to provide a means for capillary action to carry the liquid containing bluing and salt up from the main source of liquid. This further speeds up evaporation and causes the crystals to form over a larger area than just the rim of the bowl. What interested me about this question was the illusion of a tree, continually growing. Whilst our poster wasn't looking the family must have added (again from the website) more bluing, salt and water. “bloom” indefinitely into beautiful rosebuds, coral and crystal. Now I would suspect that the green like growth was due to the family member using a 'greening', i.e., a suspension of green dye in water, rather than blue. ADDED: Here's an example of a commercially available crystal tree growing kit. It's not as elegant as the poster's, but it serves the point. Not the answer you're looking for? Browse other questions tagged identification bonsai or ask your own question. What is this bonsai plant with red-tinged leaves? Please help me ID this bonsai?